Are Goats the New Chickens? Early spring is kidding season and on most goat farms it’s the busiest and noisiest time of year. Does are giving birth, babies are bleating; within days they’re prancing around the barn and pastures. On dairy farms spring means the days are again organized around milking schedules. On farms where goats are raised for meat the countdown to processing begins. The goat meat industry is one of the fastest growing segments of livestock production in the United States, according to the US Department of Agriculture’s Animal and Plant Health Inspection Service. Goats are also insatiable locavores — quite handy if you’re trying to clear some land of brush or invasive plants. “Goats are the new chicken,” says ML Altobelli, owner of Woody End Farm in Westminster, where she raises Nigerian dwarf goats for milk and to assist in landscaping. At a recent workshop she taught on raising goats, ML noted the growing popularity of the animals among urban farmers. There are three young Davises, ranging in age from five to a year-and-a-half. Madison, the oldest, has one of the does as a pet, but she and her brothers have learned that the male goats don’t stay on the farm for very long. Male goats at Oak Hollow are tagged with numbers — they don’t have names — and they’re usually with the herd for less than a year, Sara explains. The goats are weaned after 90 days and feed in the farm’s pastures and forest until they weigh around 80 pounds, usually at five months. Then they are taken to the Adams Farm slaughterhouse in Athol for processing. Sara, who studied animal husbandry at the University of Massachusetts in Amherst, would prefer to do the slaughtering on the farm. “It’s much less stressful for the goats,” she says, but since much of the farm’s goat meat is sold offsite, it has to be processed at a USDA-inspected location. The Oak Hollow goats are South African Boers, a breed known for its muscular build. Sara also raises a small herd of Saanen dairy goats for the family’s own cheese and milk consumption. Some of these goats took top honors at the American Dairy Goat Association show at the Big E (The Eastern States Exposition held every year in West Springfield, MA.) Oak Hollows’ dairy bucks and the Boers are available for breeding. The Davises practice rotational pasturing, using movable electric fencing. The goats go to a different pasture every week from May through late fall. Their herd lives outside during the spring, summer and fall. “In winter they like to roam on the snow pack rather than stay in the barn,” Sara says. “Boers prefer being outside. We make sure they have cover under trees for the hottest parts of the day in summer.” During winter, the goats are fed high quality hay. Sara, who does marketing part-time, targets health conscious, educated customers who don’t mind paying a premium for good quality, locally raised meat. Rachel Scherer’s dairy goats graze in pastures high atop Chestnut Hill in Orange. Unlike the posh Boston suburb with the same name, this rural neighborhood is populated by homesteaders. Rachel and her husband Bruce met as biology students at the State University of New York in New Paltz and purchased their land in 1981. Along with a family, they raised a host of animals including pigs, sheep and chickens. After the children grew up and left home Rachel decided to try raising goats. She favors LaMancha, a breed that traces its origins to the Spanish missionaries who brought them to California. LaManchas are known for their sweet, gentle temperaments and for their distinctive ears. Unlike the lop-eared Boers, LaMancha ears are tiny nubbins. These goats are also prolific producers of rich, high-fat milk. At first, Rachel’s goat milk and cheese developed a loyal following among her family members and neighbors. “I was working five or six hours every day, and came to the conclusion that I might as well make a business of it,” she said. Thus began the two year planning and permitting process to become a licensed commercial dairy certified to sell raw milk. The Little White Goat Dairy is named for the queen of the herd, “my first really good milker,” Rachel says. Now 11, Little White Goat is retired from milking but she still stands lookout for the herd and keeps everyone in their proper place in the hierarchy. Bruce built the dairy barn and, working with the USDA’s Natural Resource Conservation Service, developed a vegetative treatment area for wastewater from cheese production. With the assistance of grants from Massachusetts Department of Agriculture Resources (MDAR) and the U.S. Department of Agriculture, the barn’s roof is outfitted with solar panels to power the dairy’s machinery. “We had soil scientists and even archeologists checking the property to make sure everything was done properly; it was quite a process,” Rachel said. The dairy barn is hyper-insulated to keep it at a consistent 40 degrees despite the weather outside. The building includes a pristine milking parlor with two stands where goats can snack while being milked. There also is a fully equipped, spotlessly clean cheese making room with a 15-gallon stainless steel milk tank and a custom made 30-gallon pasteurizer. The milking parlor is regulated by the state’s Department of Agriculture Resources, while the Public Health Department inspects and regulates milk production and cheese making. Rachel notes that her equipment is at the small end of commercial facilities. “I wanted to keep production at a level I can handle myself.” A self-taught cheese maker, Rachel’s bible is a heavily annotated copy of The Cheesemaker’s Manual by Margaret P. Morris. 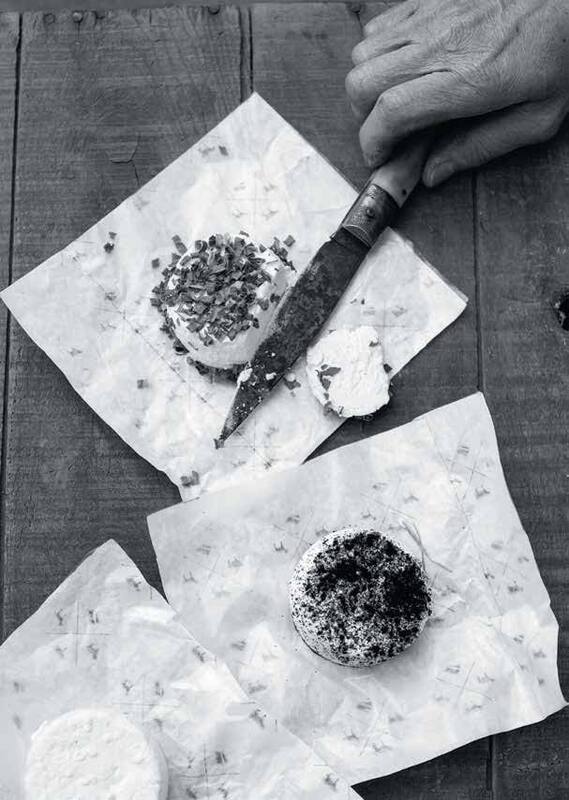 At her Little White Goat Dairy, Rachel makes chevre, a soft goat cheese, feta cheese, and a shepherd’s variety of cheese that hardens over time to a pecorino-like consistency. In addition to cheese, Rachel specializes in yogurt and kefir, a fermented goat milk drink rich in probiotics and nutrients. “I’m evangelical about kefir, she says. “It’s so good for your gut. When you drink kefir it displaces the candida yeast in your gut with yeast that will help your digestion.” There is a seasonal variation in the flavor of Little White Goat dairy products. Rachel sells her cheese, milk, yogurt and kefir at the farm and also at the Quabbin Harvest Market in Orange. She sells a selection of her dairy products through Mass Local Food, and through Central Mass Locavore, a delivery service that covers northern Worcester County. This summer she will be at the Amherst Farmers Market twice a month. Little White Goat Dairy is a member of CISA and the Massachusetts Cheese Guild. Underlying Rachel’s enthusiasm for the dairy is an abiding affection for the herd of 15 females and three bucks. “They’re very individual; each of the goats has a strong personality. The lucky LaManchas raised at Little White Goat Dairy enjoy an advantage that few goats on most commercial operations have. They get to stay with their moms and nurse. Two weeks after birth, Rachel’s goat kids are old enough to go out to pasture with their mothers; they spend the days foraging, nibbling on grass and nursing. The kids and moms are separated overnight and after morning milking they’re reunited. “When I first saw goat babies being taken away immediately after birth to be bottle fed, I realized that was something I couldn’t do,” says Rachel. “I may get less milk from each goat, but I milk more of them to make up for it,” she says.